BIO-ZYME is a ready-to-use enzyme formulation for the professional wet cleaner designed to liquefy and digest proteins, cellulose, starch, fats, oils, and greases at an accelerated rate. It is a safe, natural processing agent for the elimination of the cause of odors. It aids in the removal and hydrolyzation of animal excretion and other protein-sourced soils and odors from a variety of items including horse blankets, comforters, sleeping bags, and other washable items contaminated with body excretions, organic odors, and blood. This product also has specific usage as a carpet spotter when treating organic stains of the above-listed types on sensitive fibers. BIO-ZYME is available in 4×1-gallon cases, 5-gallon pails, and 15-gallon drums. 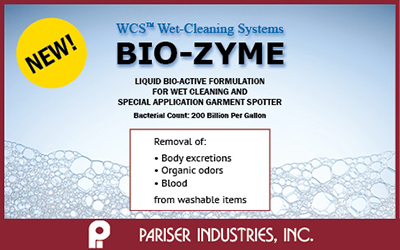 For more information, contact your local Pariser representative or distributor to see how we can help with your professional wet-cleaning needs.